Over at Sports on Earth, Jack Moore created this great graphic to demonstrate just how crazy A's manager Bob Melvin is about platoons. 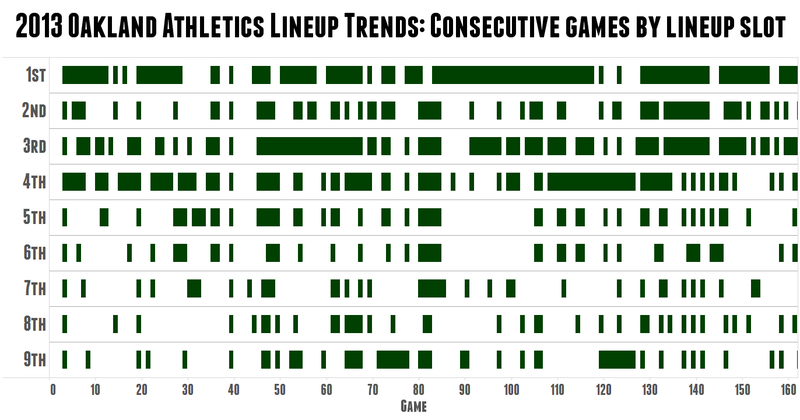 The green rectangles represent consecutive games in which the same hitter held the same spot in the batting order, with blanks showing a change from the previous game. Coco Crisp was generally the leadoff hitter (and Josh Donaldson and Brandon Moss saw good, long stretches in the three and four spots), but otherwise, as Moore notes, the A's were run like two separate teams—one for right-handers and one for left-handers. There's a lot of money sunk into the top of this order. These five hitters—Jackson, Hunter, Cabrera, Fielder, and Martinez—earned $73 million in 2013, or $13 million more than the A's entire lineup.